I've never seen my grandmother go to Bingo but when I asked her she told me that she has played it, a lot. In my 26 years I've yet to see her go, she's obviously sneaking out like a teenager going to an underground rave. Gala Bingo have a promo to celebrate Mother's Day but instead of me playing Gala Bingo, I've listed on a bingo card above (click it to enlarge) 25 reasons why I love my nan. 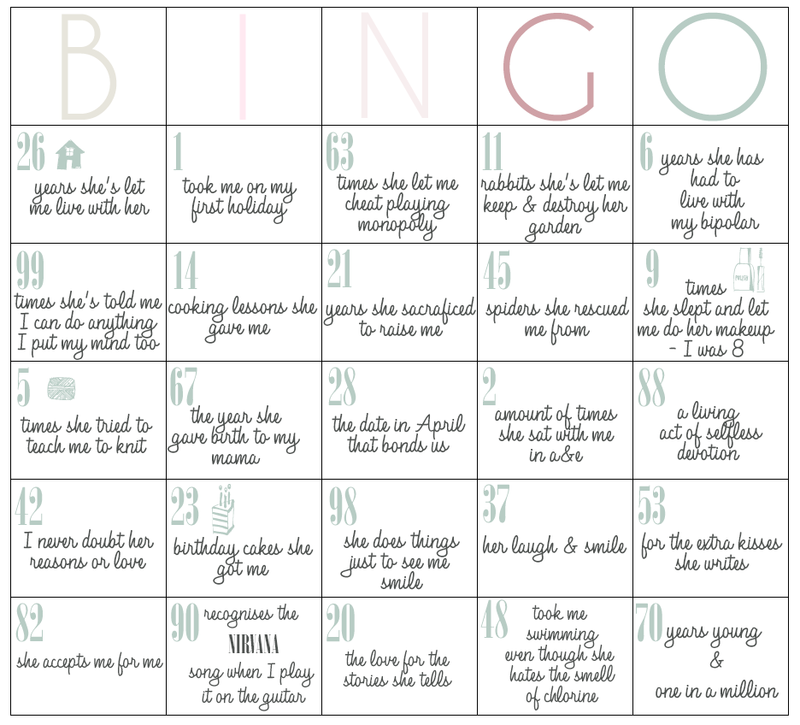 I've done it in the format that same of the numbers represent the amount of times she has done something for me - albeit a rough estimate and the other numbers are just there cos it's a bingo card. Thought it would be a different spin on Mother's Day, as she is still a mother but she's definitely like a second mother to me more than a grandmother. She has been told, this is her Mother's Day gift! - of course it's not but who would I be without a little wind up. Have you got anything planned or purchased for the special mother in your life? Indeed they are. I think your post is really lovely and it definitely shows more love & care.